Q: The DPRK supreme leader Kim Jong Un reportedly took a special plane provided by China to Singapore on June 10, where he would meet with his US counterpart. Why did Chairman Kim Jong Un take a Chinese jet? What is China's position on this? A: At the request of the DPRK, Chinese airline provided relevant services for its delegation's trip to Singapore. Q: Can you clarify whether the DPRK requested the Chinese side to do so or the Chinese side offered it to the DPRK? A: I assume you just missed what I said. The very first thing I said was "at the request of the DPRK". Q: Did China lend the plane or did you charge a price for rental? Please don't tell me to go to the relevant department, because we believe the foreign ministry is the relevant department. A: My answer is just the same as the previous one. At the request of the DPRK, Chinese airline provided relevant services for its delegation's trip to Singapore. 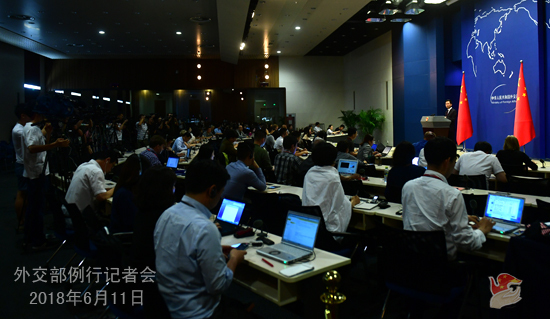 Q: According to reports, the SCO Qingdao Summit concluded yesterday. It was very successful and harmonious and there was a lot of consensus reached. By comparison, the G7 Summit ended with lots of disharmony and disagreements. Do you think the success of the SCO Summit and the relative failure of the G7 Summit shows the superiority of China's system and how China hosts big international summit? A:You raised a complicated question. Are those interpretations made by yourself or experts and scholars? Journalist: Do you think China is willing to share any lessons with the G7 or maybe they should come and seek advice from you? A: China always believes that all countries should develop state-to-state relations based on the principles of mutual respect, equality and non-interference in each other's internal affairs. Meanwhile, we also maintain that the multilateral cooperation among countries should follow the principles of openness, inclusiveness and not targeting any third party and correspond with the trend of the times featuring peace, development and win-win cooperation. The member states of the Group of Seven (G7) are all important developed countries in the world. We hope that the G7 cooperation could keep up with the trend of the times and its member states could assume due responsibilities for, make due contributions to and play a constructive role in upholding world peace and security and promoting the common development of all countries. 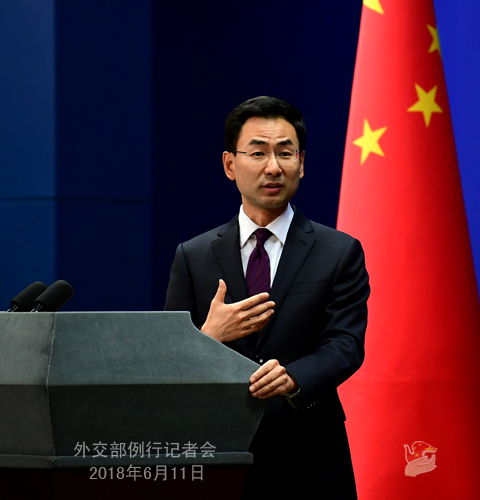 Regarding China's hosting of a string of large-scale international conferences including the SCO Qingdao Summit, I can tell you in an explicit manner that China is committed to building a new type of international relations featuring mutual respect, fairness, justice and win-win cooperation and forging a community with a shared future for mankind. Hosting those major events is part of China's efforts on this front. China stands ready to work with the international community to this end, including member states of the SCO and of the G7. Q: The Shanghai Cooperation Organization (SCO) Qingdao Summit just concluded yesterday. It attracted great attention from the international community as it is the first summit following the enlargement of the SCO. Could you tell us the highlights of this summit? Firstly, the Qingdao Summit has added new dimensions of the age to the Shanghai Spirit, namely, mutual trust, mutual benefit, equality, consultation, respect for diversity of civilizations and pursuit of common development. Over the past 17 years since its inception, the SCO has enjoyed a strong momentum of growth. This, in the final analysis, is attributed to our adherence to the Shanghai Spirit, which transcends such outdated concepts as clash of civilizations and Cold War and zero-sum mentality and rejects to seek the exclusionary clubs. In his speech at the Qingdao Summit, President Xi Jinping put forth a series of important concepts and propositions including the outlook on development, security, cooperation, civilization and global governance, and summed up the basic concept on building a new type of international relations, which added new dimensions to the Shanghai Spirit and bestowed new historic missions on the SCO. Secondly, the Qingdao Summit has specified new goals for the SCO. In his speech, President Xi Jinping pointed out that we should follow the principle of achieving shared growth through discussion and collaboration in engaging in global governance, continue to reform and improve the global governance system, and work with all other countries to build a community with shared future for humanity. This major initiative has been confirmed in the Qingdao Declaration and become the most important political consensus and goal for the eight member states of the SCO. Improving global governance and building a community with a shared future for mankind are the common cause of all countries around the globe. As a comprehensive regional organization composed of eight member states, four observer states and six dialogue partners, the SCO has the responsibility and capability to become a more important and positive force in global governance and play a leading role in building a community with a shared future for mankind. Thirdly, the Qingdao Summit has formulated new action plans for future cooperation. At this summit, the leaders of the member states signed, approved and inked 17 cooperation documents and witnessed the signing of six others, marking the largest number of outcomes of all SCO summits. The summit reaped tangible outcomes and made concrete plans in many areas such as further promoting good-neighborliness and friendship, combating terrorism, separatism and extremism, advancing trade facilitation, seeking greater synergy between the Belt and Road Initiative, the development strategies of all countries and regional cooperation initiatives, and enhancing cultural and people-to-people cooperation as well as the exchanges with non-member states. Implementing all the consensus reached by leaders at the Qingdao Summit is the direction for the SCO to move towards and the major task for it to accomplish going forward. As a founding member of the SCO, China always regards the SCO as a diplomatic priority. We will join hands with the other member states to follow through on the outcomes of this summit in a comprehensive manner and forge a more united SCO with more efficient cooperation, more vigorous actions and a brighter prospect. Q: What are China's expectations for the upcoming DPRK-US Summit in Singapore? A: We have made clear China's position on it many times before. Currently, the international community are closely following the DPRK-US Summit. 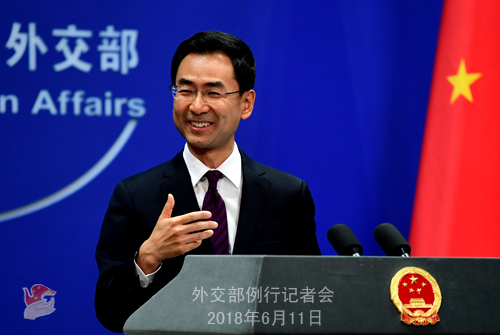 China sincerely hopes that the summit can be held successfully and achieve positive outcomes, thus contributing to the denuclearization of the Korean Peninsula and the political settlement process of the Korean Peninsula issue. Q: We noted that President Xi Jinping awarded the visiting Russian President Vladimir Putin the Friendship Medal on June 8, making him the first foreign leader that received this medal of highest state honor. It is also noted that on the night of the same day, President Xi and President Putin rode a high-speed train to Tianjin to watch an ice hockey friendly match between Chinese and Russian youth teams. Why did you make such special arrangement? What do you think of President Putin's state visit and the future of China-Russia relations? A: President Vladimir Putin's visit is a full success with fruitful outcomes, one that will inject strong new impetus into the development of China-Russia relations in the future. During their meeting, the two state leaders planed for the development of China-Russia relations, agreed to continue to guide and elevate our bilateral relations and across-the-board cooperation to a new level, and exchanged in-depth views on international and regional issues of mutual interest. The two heads of state signed and issued a joint statement and witnessed the signing and exchanging of 14 weighty cooperation documents between the two governments, relevant departments and businesses. I believe you may all have noted the highlights of the state events. President Putin has forged and promoted the current high-standard China-Russia relations and made important contributions to the ever-lasting China-Russia friendship. He is also the head of state of a major country who is the most familiar to the Chinese people and came to China for bilateral visits and international events for 19 times. The presentation of the Friendship Medal to President Putin by the Chinese side fully testifies to the profound friendship between the two countries and peoples. This is also the first time that the two heads of state rode a high-speed train to Tianjin to watch an ice hockey friendly match between Chinese and Russian youth teams, which started a new practice in the interaction between the two heads of state and will strongly promote our cooperation on high-speed train and the exchange on ice and snow sports. Q: The Indian media positively appraised the meeting between Chinese and Indian leaders on the sidelines of the Shanghai Cooperation Organization (SCO) summit in Qingdao. How does China evaluate the outcomes of this meeting? A: President Xi Jinping met with Prime Minister Narendra Modi on the sidelines of the Shanghai Cooperation Organization (SCO) summit in Qingdao, during which they exchanged in-depth views on bilateral relations and issues of mutual interest and reached extensive consensus. The two leaders spoke positively of the role their informal meeting in Wuhan has played in guiding the cooperation in various fields between the two sides and agreed that we should cherish and preserve the current development momentum in our bilateral relations. We need to accelerate the implementation of the consensus at the meeting in Wuhan, maintain strategic communication, enlarge economic and trade cooperation, expand people-to-people exchange and promote further development of China-India relations. The two sides agreed to maintain high-level interactions, strengthen institutional exchange in various fields, set new trade goals and establish high-level people-to-people exchange mechanism led by foreign ministers. The Indian side said it would complete the approval process for Bank of China to set up its branch in Mumbai. The two leaders also witnessed the signing of cooperation documents on India's rice exports to China and the flood forecast of trans-boundary rivers. This meeting carries on the sound atmosphere of the meeting in Wuhan and will guide the sustained sound and steady development of China-India relations. Q: According to media reports, China's coast guards have been "forcefully taking" the catch of Philippine fishermen in the waters off the Huangyan Island regularly. Is this true? Do you have any comment? A: China has made appropriate arrangement for the Philippine fishermen to fish in relevant waters out of goodwill. This policy remains unchanged. At this point, the China-Philippines friendly relations have taken on a positive trend, and China has a clear and firm determination to commit itself to consolidating and strengthening China-Philippines relations. The Chinese coast guards have been safeguarding peace, order and tranquility in relevant waters and offered humanitarian aids to Philippine fishermen for many times. They have always acted in accordance with the law. As to whether the situation mentioned by the media exists or not, the Chinese side is now conducting an investigation seriously. If what the Philippine side claimed is true, I believe relevant Chinese departments will handle that in a serious manner. Q: According to reports, the US government recently asked the Japanese government to reduce its holdings of plutonium. What's your comment? A: I'm not aware of the situation you mentioned. I would like to say that when it comes to the nuclear issue, Japan has its due international responsibilities and once made commitment in this regard. We hope it can fulfill its international obligations and honor its commitment. Q: On the sidelines of the SCO Qingdao Summit, Presidents of China and Pakistan met and discussed bilateral relations. Do you have more information for us? A: On June 9, President Xi Jinping met with Pakistani President Mamnoon Hussain in Qingdao, during which they had a friendly and in-depth exchange of views. During the meeting, President Xi pointed out that China highly values its ties with Pakistan and stands ready to have more frequent high-level exchanges and closer strategic communications with the Pakistani side, step up friendly exchanges in various areas, steadily advance the China-Pakistan Economic Corridor and the cooperation in such areas as energy, transportation and infrastructure under the framework of the Belt and Road Initiative, and elevate the level of the cooperation on counter-terrorism and security so as to move forward our bilateral relations. President Xi Jinping stressed that China will continue to firmly support Pakistan in safeguarding national independence, sovereignty and territorial integrity and independently choosing a development path and that China and Pakistan will as always steadfastly support each other on the issues concerning each other's core interests. President Hussain said that China is Pakistan's reliable friend and staunch partner and that Pakistan-China relations are unshakable. The Pakistani side abides by the one-China policy and firmly supports China's core interests. Pakistan is willing to maintain high-level exchanges with China, deepen cooperation in areas such as economy, trade and security, advance the China-Pakistan Economic Corridor and coordinate with China on international and regional issues closely. 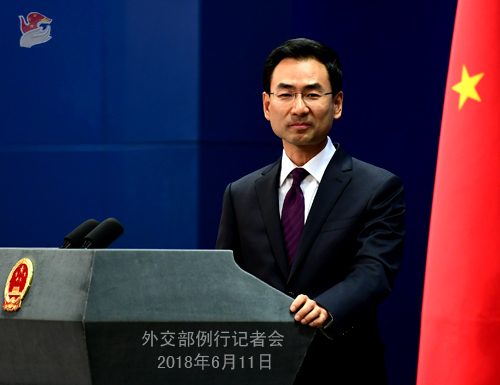 Pakistan supports China in playing a bigger role in international affairs and believes this is of vital importance to upholding global security and stability. Q: President Trump once said that officially ending the Korean War would be discussed at the upcoming DPRK-US summit. It is speculated that one possible outcome of this summit is the signing of the declaration on ending the war. What is your comment? A: We have responded to similar questions many times before. We hope that the DPRK-US summit can be held smoothly and achieve positive outcomes and more steps can be taken along the right path of achieving the denuclearization of the Peninsula and politically resolving the Korean Peninsula issue. As a close neighbor to the Peninsula and a major party, China is willing to work with other relevant parties to stay committed to realizing the denuclearization and long-lasting peace and stability of the Peninsula.